Do you like this decoration or should I do something else?Opinions? it looks great i wish i could found one for free a cross would fit in the design too. I like it so much as the photos (which are blurry I'm afraid) can show me. What is it? Hm. Weird. The second photo, if anything, is over-sharpened, not blurry. It looks like the Celtic "three horses". For me, I prefer pommel decor that fit's inside of a pommel recess. Most of the time, pommel decor placed on a flush surface looks 'forced', and looks out of place. Not to mention, if the design doesn't suit the era. I think I have to agree with Nathan on this one. I recently 'almost' placed a simular style pendant in my Windlass type IV & realized it didn't work at all for the same reasons as he noted. Karl, your pommel does not need any decoration. The antique look is sufficient just by itself. Anything you put on it will look out of place and foreign. It depends on what you are looking for. If you wish to keep that sword within the realm of historical reproduction, then the celtic trilogy is outdated by a millenia. On the other hand, many of us drift back and forth from reenactment and historical propriety to the more accessible fun & games of anachronism and pseudo-medieval groups. If that's the case, then maybe your invented character has a celtic lineage in a medieval time frame, so you are looking for decorations that bring this to the forefront, and then it becomes purely a question of personal preference & aesthetics. Aesthetically, without regards for historical context, I find the horse trilogy very attractive. 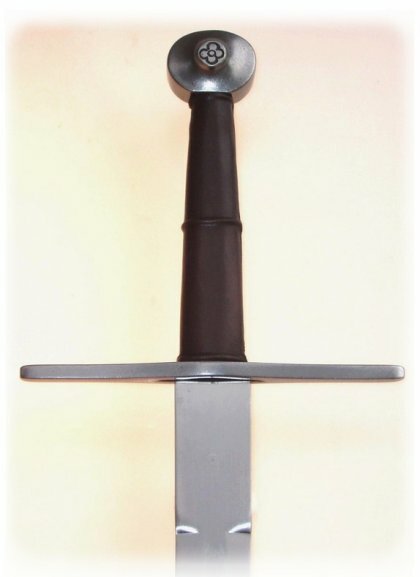 You could eventually get a scabbard chape worked with the same symbols, as there are now on this site quite a few artisans who show first rate metal work and scabbards... but if you want backing in terms of historical correctness, then I don't think that will happen.Cheers, JC. 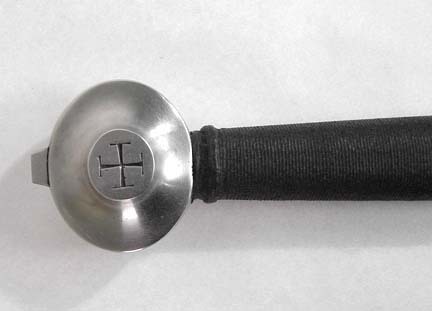 Thanks everyone for the imput:-) I guess i`ll leave the pommel bare.That brokes a question though.Would a Scott or Irish knight, of the 13th century,decorate his kit in Celtic motif?That being kindof thier heritage. No, Celtic knotwork art was long out of style at that point, by a couple hundred years. Plain wheel pommels like everyone else, some with elongated tips were coming in during the fourteenth century. Cruciform hilts and Christian symbolism seems to have been popular then, especially in the Highlands and Islands. Lowlanders used exactly the same hardware as their English or Continental neighbors. in a word - unlikely. much of what today is considered "celtic art" is really pre-christian, i.e. bronze and very early iron age. de Clare, de Burke, Fitz Stephen, Fitz Gerald, de Courcy, de Umfraville, de Soules, de Bruce, Balliol, Comyn...... I could go on these are just a few that come to mind while typing............... these are all Norman surnames. the Normans invaded Ireland in 1171 and had made in-roads into Cumberland and Scotland well before that. By the time of Edward I of England and the death of Alexander III, many of the Scottish knights or nobles were descended from Normans, Robert Bruce and John Balliol, being the two obvious heavies contending for the crown. Both were of Norman descent. The western Highlands and Isles of course being culturally a bit more isolated. Also, what passes today for "celtic art" was actively suppressed by the church in the 12, 13th centuries as being pagan and heretic. just in general most artwork in the 13th c is christian in theme, including Ireland and Scotland. I don't know that we have any decorated pommels from the 12th-14th centuries that have definite Scottish or Irish provenance. I'm going to both agree and disagree with your post, Thom. I agree that this piece is anachronistic. While I am unsure of the image's provenance, it has the looks of something one might find on a Pictish cross. what passes today for "celtic art" was actively suppressed by the church in the 12, 13th centuries as being pagan and heretic. Actually, I think the reverse is true. What most people think of as "celtic art" (meaning pagan Irish or Brythonic art) is actually a post-Christian development. Look at the Book of Kells or Durrow or any of the Irish or Scottish high crosses. This mixture of organic and zoomorphic points to a fusion of Irish, Picitish and Anglo-Saxon art forms and is most often found in ecclesiastical art. This belongs to the centuries following the Christian ascendancy and has nothing to do with the ultimate La Tene forms that would have predominated in the Pre-Christian Iron Age. But art forms evolve. The Ultimate La Tene was fused together with (and eventually gave way to) the more complex knotwork patterns which are relatively common up until (I think) the late 11th century . Eventually the Normans would bring their continental tastes to bear on their surroundings and we see a flourishing of romanesque et al. No suppression-- just a natural evolution.